So the Apple Watch is finally here, and what a ride it was. Two years of intense speculation, culminating in a vintage Apple “one more thing” reveal. So now the dust has settled the next round of speculation starts: the screen, the apps, battery life and features are the next to be dissected and pored over; but in the meantime we've taken a look at the rumour mill, and work out what we got right the first time around. After a year of fruitless speculation about the iWatch, attention briefly diverted to activity trackers in April 2014. After some rumours about Nike’s business (see below) a few outlets went on a limb to suggest that in fact Apple was working on a band – or 'iBand'. It sure looked pretty, but like much of the rumour mill, totally wide of the mark. The reasoning behind the iBand was that key designers and developers started moving to Apple. The inference was that a partnership would emerge between the two giants. It wasn’t just Nike that was fingered as a potential backer. Swatch had a brief stint as rumour mill favourite , but swiftly moved to deny its involvement – crashing its stock , and forcing the company to answer questions of exactly why it wasn’t involved. The saga continues. There wasn’t a specific rumour that denoted that the Apple Watch would be called the iWatch, it was just decided by the rumour gods. However, the moniker stuck, and somehow ended up being much cooler than the reality . 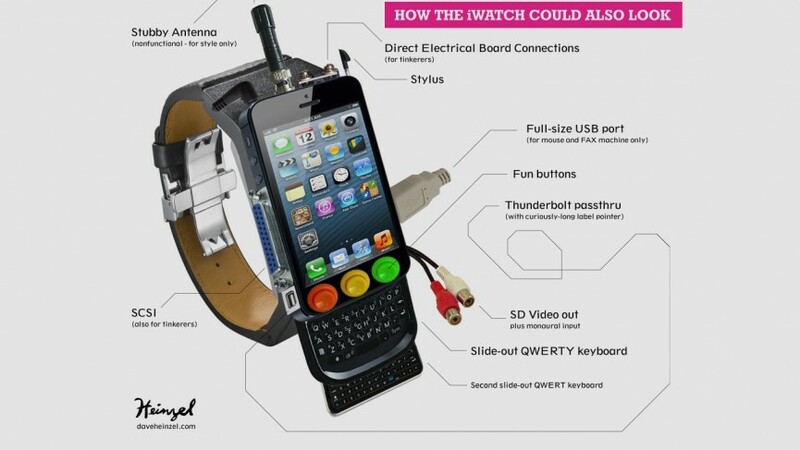 In August, an old Apple patent surfaced that referred to the iWatch as the ‘ iTime’, but mercifully. that was wide of the mark too. Right on the jackpot, the rumour mill correctly predicted that sapphire glass would adorn the face of the Apple Watch. Whether or not this caused the delay in shipping, as called by The Register, we’re not sure, but a triumph for the iWatch watchers. Well done, team. Another direct hit from the speculation chopper was on the sizes. Reports out of Taiwan back in July highlighted that Apple would launch three models of its Watch, which turned out to be bang on the money. Thanks to some more misleading patents, it was decided that the iWatch – or iBand – would make use of curved glass technology, much like the Samsung Gear S. We’re still not sure on the specifics of the screen, or what the resolution will be, but it’s sure as hell not curved. Scare stories about Apple missing a Christmas release date also proved to be correct, let by extremely well-connected rumour-monger John Paczkowski over at Re/Code. Re/code hit the grand slam of Apple rumours, first predicting the correct date of the launch, followed by the delivery . Panic also spread when Apple Watch’s $400 price tag was outed just before the launch. Source stated that Apple was ‘considering’ the large asking price, but fears were quickly allayed when Apple confirmed the price would be a mere $349. Phew. A large portion of the iWatch watchers – including Bloomberg – incorrectly asserted that the Apple Watch would fork iOS for a complete experience. Apple chose a completely bespoke experience, undoubtedly for the best. Some early iWatch rumours said that Apple would use wireless charging for its watch, which could work up to a metre away. While that would be a foil for poor battery life – something Apple hasn’t spoken about as yet – the Watch charges in a more traditional manner: with a wire, connected to the wall.